How cool is this basket? Just check the size of my grin when I ride it around. Winding the pedals up to full speed and looking down at a six pack nestling comfortably in the basket brings a special kind of joy. The Paul Components Flatbed basket-rack is one of the nicest accessories anyone could buy for their bike. 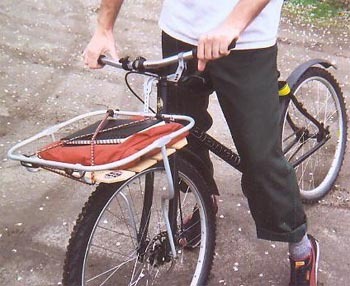 Just like the website says, it is "a premium load-carrying attachment for your bicycle." It's definitely a premium item. The aluminum uprights and frame are anodized, giving it a soft, dull look, and the slats are real maple hardwood. Plus it comes with a couple aluminum spacers that help mount the upright supports away from the fork legs at the dropouts-everything is very well thought out. Mounting the unit was pretty easy. I followed Paul's instructions, but found a couple of ways to improve the setup. Firstly, I decided to treat the wood slats with tung oil to protect them from water and dirt. That meant undoing a few screws to remove the slats from the frame, and a couple of minutes with a rubbing cloth. The oil gives the wood a more glossy finish, and makes it less permeable to water. It's well worth doing, especially if you live in a damp climate. Secondly, I made my own spacers. The stock ones are nice, but they came up short because the fork dropouts on my Bianchi DISS are spaced a little narrower than Paul allowed. I made my own spacers from some aluminum bar. It was very easily done with a hacksaw and a drill. The new spacing increases the bending moment at the dropout eyelet, but I have yet to carry anything heavy enough to bend the eyelet or mounting bolt. The basket is more than a good looker--it's also very functional. Prior to owning my basket I would make my small grocery runs with a messenger bag. Gallons of milk and similar bulky purchases were downright awkward. I can now stock up on food and still ride home comfortably. Plus, I get applause when I show up to BBQs with beverages lashed to the basket. Surprisingly, the basket is fine to ride offroad. Unloaded, the effect on handling is minimal. Of course, a full load tends to make the front end flop a bit. But, like I said, it's pretty cool to be able to wind the fix up on some dirt road with a load of food securely stowed in the basket. I guess the Paul Flatbed could really increase your riding range if you wanted it to. Certainly, it won't give you a sweaty back like you get with a backpack. All this fun comes at a price. 150 US dollars isn't cheap for a piece of bike furniture. But I don't think anyone will regret buying one, it really is that cool. Besides, if you get in the habit of using it for grocery runs, it will pay for itself PDQ--and you'll be helping save the planet. A couple of issues back, Kevin wrote for us about the kung fu of fixing.